A group of wine lovers gathered at the Renaissance Hotel in Atlanta after a long day of challenging conversations at #HRevolution last Saturday. When a bunch (gaggle? murder? family?) of HR professionals and generally super smart people get together for thought provoking revolutionary style engagement, eventually we all must stop and take a breather. 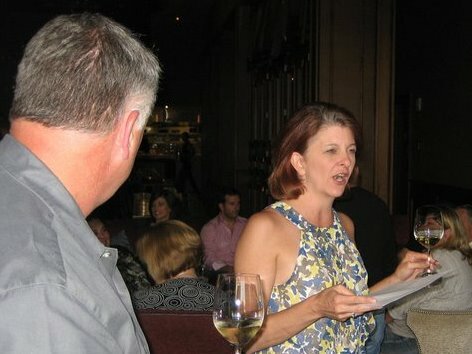 That breather was a wine tasting I organized for about 25 of us – wish we’d have had room for more. 9 grapes. The Lucky Edition (#13, or not…) consists of Pinot Gris, Müller-Thurgau, White Riesling, Semillon, Muscat Canelli, Gewürztraminer, Pinot Blanc, Chardonnay, and Sylvaner. While the grapes for the #9 are not published that I can find… tasting confirms a similar profile – though we don’t know the exact blend. The #9 has aromas of tropical fruit, orange blossoms, allspice followed by pear, peach and honey. The wine pairs well with Asian, Middle Eastern, and Spanish foods. I’ve also paired it with Caribbean style fish or sipped it on its own. Its slightly off dry, with balanced acidity Best not too cold. #9 has been found for as little as $10 per bottle, the 14th edition is available at $15. Still a great value for this wine. 80% Garganega, 15% Chardonnay, 5% Soave Trebbiano. Crisp and pure, with scents of minerals, apple, banana and lemon blossoms. Medium-bodied, dry and fresh, with notes of citrus fruit, pear, grapefruit and hints of hazelnut. pair with Shellfish, Fish, Sole, Halibut, Salmon, Tuna, Poultry, Mild cheese. There isn’t much intensity on the nose of this wine. I gave it a while to open up and it’s still tight. Although it lacks intensity, the aromas are pleasant with jammy blackberry and a soft, dusty earthiness. On the palate it has much more concentration to the flavors than the nose would indicate. This is a big wine that gives loads of blackberry and plum flavors up front, leading into cocoa that carries into a fairly long finish. Fine tannins and sufficient acidity give this wine reasonable structure. Aged 24 months in new french oak. You can buy these wines from the winery websites where they are listed. I encourage you to look at your local wine shops for them as well to support local business. Or get them from places like Total Wine or use a tool like Wines.com to locate a merchant. I’ll have posts in the coming days on my everyday wines list, and notes and reviews of the wine apps for iPhone and Droid that have been most useful. Thanks to each and every one of you for attending. I had a lot of fun, and more great conversation. I’d love for those who attended to add their thoughts about their favorites (and not so favorites) in the comments below. And last I heard, that pourer was still trying to finish the service…. Posted in tasting notes, travel. Bookmark the permalink.